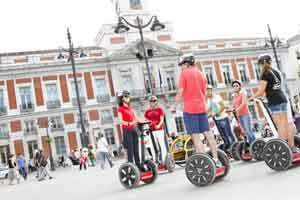 Go for the perfect combination of convenience and adventure on this Tour of Madrid on a Segway. Thanks to the Segway and the company of an expert guide at your side, you will be able to tour the Spanish capital and see its most spectacular streets without getting at all tired. Below you will find details about the three different tours that you can book on this page. The 90 minutes Tour: this route, starting from the Plaza de la Ópera, will enable you to see the city's most famous streets and monuments including: the Temple of Debod, Plaza de Oriente, the Royal Palace, the Statue of Philip IV, the Almudena Cathedral, the Church of St. John the Baptist, Plaza de la Villa, the Cisneros Palace, Calle del Codo, Plaza Mayor, Puerta del Sol, the Gran Vía and much more. The Tour finishes in Arenal street. The 150 minutes Tour: with this itinerary which lasts for two and a half hours, you will have the chance to see some of the city's most beautiful attractions as well as enjoying a few tapas in the city's famous market. The route starts from the Plaza de la Ópera where you can admire the statues of Don Quixote and Sancho Panza. From the Plaza de España, the next stop will be the Egyptian Temple of Debod. Following on from here, you will head towards the Plaza de Oriente with the Royal Palace and the Royal Theatre, Sabatini's Royal Gardens and the Almudena Cathedral. The following stops will be the Church of St. John the Baptist, Plaza de la Villa, the San Miguel Market and in the latter, you will make a stop to savour some delicious tapas in the Paella y Olé restaurant. The tour then continues on to other vitally important locations such as: the Plaza Mayor, Puerta del Sol and the Gran Vía, finishing up once again in Arenal Street. The 180 minutes Tour: with this itinerary which lasts for 3 hours, you will have the opportunity to explore Madrid in depth in an original and fun way. The itinerary starts with the main area of Madrid's city centre: the unmissable Royal Palace and then following on to the beautiful Plaza de Oriente and the Almudena Cathedral, dedicated to the Patron Saint of the Spanish capital. Following on from here, you will visit the Egyptian Temple of Debod which is located in the Parque de la Montaña where you will make a brief stop to admire spectacular panoramic views of the city. The Tour then continues with the Segovia Bridge and you will start to explore the famous area of Madrid that is known as "La Madrid de los Austrias" until you reach the covered food market, the San Miguel Market, which is the most famous in the captial. From here you will carry on to the Plaza Mayor, Plaza de Santa Ana, Paseo del Prado, Puerta de Alcalá, the Gran Vía and the Puerta del Sol. The Tour will finish either in Plaza de Isabel II or in Plaza de la Ópera. On the day of your visit, just show the tickets on your smartphone at the entry to the office. Available from April to October from 09:00 to 21:00 hours and from October to March until 19:00 hours.